The other day I asked all my fabulous readers, to help me make A Box of Chocolates even better by completing a short survey. I was thrilled to see the responses roll in. I can't even begin to say how appreciative I am that so many of you took the time to answer some questions for me. I know time is precious so thank you bunches for spending it on me! It was very interesting reviewing the results so thought I would share them. A couple answers were especially surprising and I think I'll use them for some blog posts later since they would lead to some great blog discussions. But for now here are the results. How did you find A Box of Chocolates? From another blog ranked number one with 43% of the votes, I visited their blog first was second with 25%, and Twitter with 22%. Memes/Carnivals also accounted for 9%. What does this tell me? If you want people to come visit you, you must get out there and participate!! How do you read A Box of Chocolates? Not a big surprise here that 50% of my readers use a reader considering that is how I read all my favorites. Visiting my blog directly through the website did receive 41% of the vote, with a small percentage of readers being email subscribers and reading through Facebook and my Networked Blog. Is my blog reader friendly? 81% of you said that everything looks fine (aren't you sweet), but 19% did say I needed to be careful because it was looking a little busy and 1 person suggested I spring clean. I am excited to say that I do have something up my sleeve that I think everybody will like so stay tuned! Rate the topics you enjoy reading about 1-10. Personal, family, and pictures were the top three. Guess my life niche is working out for me! Then recipes, as a teacher, weight loss, running/fitness. Wrapping it up was memes/carnivals, giveaways, and product reviews. Glad to hear that you all care about me and my family more than the free stuff! How often do you prefer I post? This questions had the most surprising results. 38% of my readers believe that consistency is not important. Isn't that interesting? But, 31% said they would prefer 3-4 times a week. That's doable! 22% said at least 1 time a week and one reader loves me so much they want me to post everyday! How do you prefer I respond to your comments? Again, surprising results. 39% said they like me to visit them and comment there, while it was a three way tie with 29% each of readers who like my email reply, reply in the comment section on my blog, and those who could care less if I respond to their comment or not. Usually I email reply to comments since all comments are emailed to my blog account. If they don't have an email set up though then I try to visit their blog and comment there. I rarely ever reply on my own blog, although I think I'm going to look for plug-ins to perhaps try it out. You may see further discussion of this question on a future post where I ask for more help! How do you feel about advertisements on my blog?You either don't care or give me two thumbs up so the advertisements are staying! The last two questions were open ended and the responses I received will lead to great blog fodder at some point. The first question asked "What do you like about A Box of Chocolates", and I'm just going to say that if you ever need a bloggy pick me up send out a survey about what your readers like about your blog and you will feel so much better! Thank you all for your sweet comments. The other question asked, "What is one piece of advice or suggestion you have for A Box of Chocolates?" I loved that people were honest with their advice and gave me lots to think about. A few definitely stimulated some ideas for making some minor changes around here. Thank you for taking the time to constructively critique. Oh right, I almost forgot my #10 question: "What is your favorite kind of chocolate?" Let's just say after reading those comments I had to bring out a towel to mop up the drool on the floor. So that's what the survey said! I definitely recommend using a quick survey if you are interested in what your readers think about you and your blog. It was very enlightening. If you haven't taken my survey I still have it up and would love to have more responses so I can tackle that spring cleaning from #3. You can find the link to the survey here. I'm even offering some free chocolate, but hurry to enter because next Saturday will be the final day to win! Thank you again to all my readers who took the time to share their feedback. You all ROCK!! Hi Mel! I'm stopping by from the BBootcamp page and I'm looking forward to meeting you in Baltimore! This was a really neat summary of (what sounds like) a worth while survey! I've never done that before, but I can see where the input would be valuable. Regarding Comment Replies... I just moved to WPress and there is a great plugin that will allow you to do that. However, I don't think Blogger will allow you to use Plugins (?). SO... if you're big news includes moving to WP check out the "WP COMMENT THREAD" plugin. It's great. 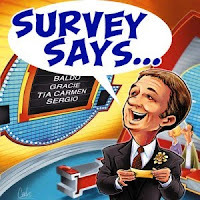 I missed the survey! grr! But I love the new design. Makes me want to go eat some chocolate now though lol.